With every expansion comes improvements to the game and new systems to explore. The AI in Battle for Azeroth is said to be the most advanced AI put out to date, which will largely play out in Warfronts and Island Expeditions. Island expeditions are 3-player scenarios designed to provide challenge and continually fresh experiences. They do not require specific roles so queue times are kept short. Players will be competing against advanced AI of varying difficulty—Normal, Heroic, Mythic, or PvP—to be the first to collect a certain amount of Azerite. These adventures are procedurally generated—meaning every expedition you enter will be different than the last in terms of terrain, enemies encountered, composition of the enemy team, and locations of resources, for starters. The new 20-player PvE Warfronts harken back to the Warcraft III RTS days. The first Warfront will take place in Arathi Basin. Players will be tasked with gathering resources to construct various buildings to launch an assault on the enemy faction. Whichever faction launches the attack will win, so as to prevent one faction from continually dominating the other. Weather varies across every zone in World of Warcraft and dynamic weather has been present since vanilla WoW. Weather in the new zones appearing in Battle for Azeroth is more robust than we’ve seen in the past. Rain- and snowfall may fall at varying intensities. The weather can also drastically change in during an Island Expedition. For example, players may be subjected to movement speed reduction with the onset of blizzarding conditions on an otherwise sunny island with the presence of a massive ice elemental. Stormy weather could bring lightning that may prove to be a shocking interruption. In order to solve an ongoing issue with collision for the smallest races, some changes were made to the camera anchor point. The anchor points have been standardized across the various races, which means, shorter races such as Gnome and Goblin, players may notice the anchor is slightly above the characters head. Legion introduced us to level and zone scaling on the Broken Isles, each zone could be completed in any order at any level 98-110. Later during the expansion, Patch 7.3.5 this scaling tech was applied to all zones in the game, allowing players to more freely choose their leveling paths. This also opened up a wider level range for expansion zones, such as Outland and Northrend can be accessed at levels 60-80. This scaling goes forward in Battle for Azeroth. Furthermore, the doing-away with separate PvP and PvE realms with the introduction of War Mode. 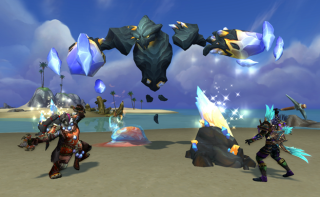 World PvP has been overhauled so players also scale to one another for levels 110-120. Introduced in the Battle for Azeroth pre-patch, DirectX 12 support was added, while DX9 was removed. With DX12, Fullscreen is replaced with Fullscreen (windowed.) While this isn’t a change unique World of Warcraft, it is how DX12 naturally works. Be sure to update your drivers to prevent any performance issues with the change. DX11 will continue to be available.